What you love most about working for the Griffins: The customers. The little kids that are filled with excitement and curiosity, the looks are on their faces when they enter the rink. 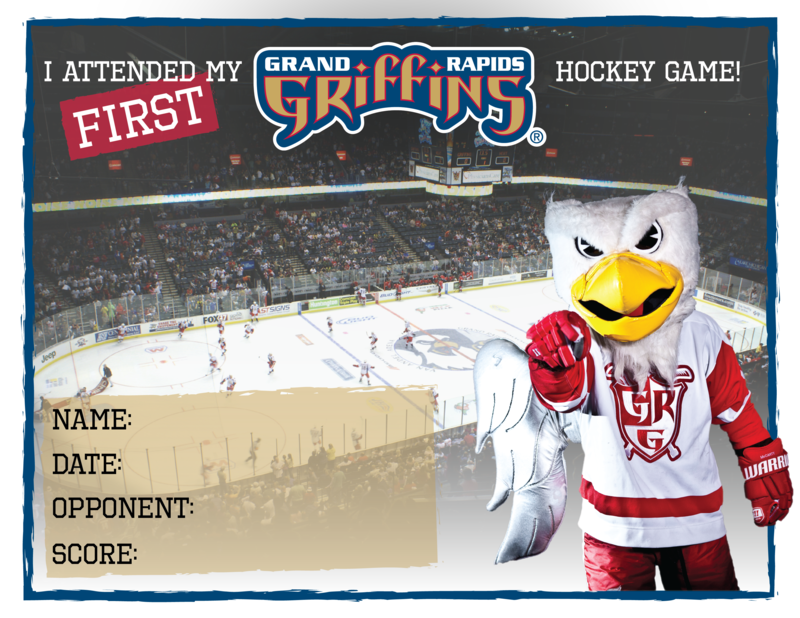 Favorite Griffins memory: When we hosted Training camp in the early years. Favorite all-time Griffins players: Matt Ruchty, Darcy Simon, and Ed Patterson. Best thing about your job: Flexibility. We can try different things in all aspects and can adapt and evolve with the changing market. States (and provinces or countries) you’ve lived in: I have been in MI all my life. Spouse’s name/year you were married: Kim and I were married in 2003. Children: I have a daughter named Sydney and a son named Sam. College degree/year/school: Degree in Business Administration from Cornerstone University, 2005. Personal/professional hero(es): While not necessarily a hero, but Max Siepling (Howie’s Hockey Tape) a local business owner that sells hockey tape worldwide. Came up with a plan to market a product (a hockey household item) he has used since he was a little hockey player and turned a simple roll of tape put his name on it and travels the globe to promote his idea. Proudest professional accomplishment: I was able to get Pat Smiggens, Brad, “AJ” Andrewszjeski, Lourie Boike, and Scott Gorsline to participate on a hockey team in one of our adult leagues. Most memorable on-the-job mistake/embarrassing moment: Sliced my thigh open with a razor blade cutting floor tile in one of the restrooms. Favorite charities/charitable causes: PORT and the Griffins Youth Foundation. Most exciting/unique thing you’ve done or place you’ve visited: Played golf at Kapalua in Maui. They host the Mercedes Benz Championship there. I have teed it up where the likes of Ernie Els, Steve Stricker, and Phil Mickelson have played. Sports played growing up: I did not participate in any until I was a senior in high school. Hidden (or not so hidden) talents: I am pretty good at organizing vacations or golf trips. An interesting fact about you: I have an innate sense of direction. Only achieved this skill since I got married however. Favorite foods: Sushi, Mexican, and Italian. Favorite music artists: Too many to name. I enjoy all kinds of music. Favorite book or author: Suzanne’s Diary for Nicholas by James Patterson. Favorite pro/college sports teams (excluding Griffins): University of Texas Football, Michigan State Hockey, any team any of my friends play or coach for, i.e. Penguins, Capitals, Red Wings. Favorite recreational activities/hobbies: Watching the Triple Crown with my family. We make kind of a big deal out of it. I love to read and can usually read a book pretty quickly. I love to travel around with my family.